Gary Allen, race director of the Mount Desert Island Marathon, receives a sponsorship check from Lisa Parsons and Steve Gurin of Bar Harbor Bank & Trust for the 17th annual event scheduled for Sunday, Oct. 14. 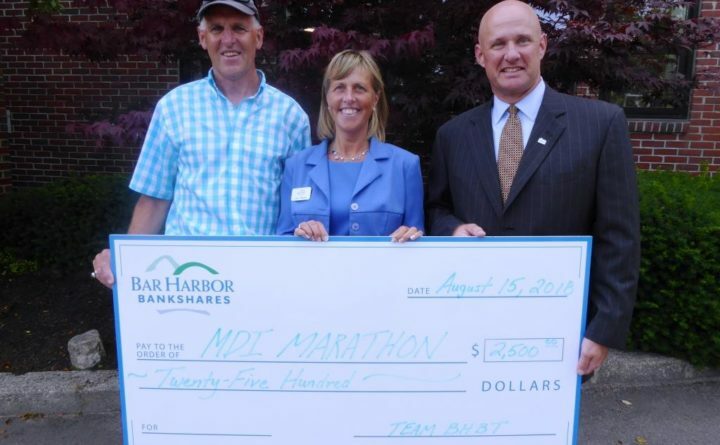 BAR HARBOR — Gary Allen, race director of the Mount Desert Island Marathon, received a sponsorship check from Lisa Parsons and Steve Gurin of Bar Harbor Bank & Trust for the 17th annual event scheduled for Sunday, Oct. 14. The race starts in Bar Harbor and finishes in Southwest Harbor, passing all four of Bar Harbor Bank & Trust’s branches on Mount Desert Island. This year 2,000 race participants are expected, which will bring many to Mount Desert Island as the summer season wanes. “We are proud to call Bar Harbor Bank & Trust a founding sponsor of the Mount Desert Island Marathon, said Gary Allen, Race Director and Founder. This important and appreciated sponsorship helps provide a transportation network for marathon weekend, a free kids run, and the ability to host a true world-class sporting event on Mount Desert Island, which impacts positively all island communities.” For more information, go to: www.runmdi.org.